The Economist has a Special Report on “The melting north” (hopefully that works for you, I have a subscription so I’m not sure if its behind their paywall or not). – is not desperately exciting for anyone who has been paying attention. What is interesting is that there isn’t even the smallest sop to the deniers in there. The sea ice record is taken for, well, for exactly what it is. There are no stupid quibbles about the temperature record. No-one wastes their time asking Lindzen or Spencer what they think of the trends, and no-one proposes that “its the sun” or space aliens or whatever. Yet how to reconcile the environmental risks of the melting Arctic with the economic opportunities it will present? The shrinkage of the sea ice is no less a result of human hands than the ploughing of the prairies. It might even turn out as lucrative. But the costs will also be huge. Unique ecosystems, and perhaps many species, will be lost in a tide of environmental change. The cause is global pollution, and the risks it carries are likewise global. The Arctic, no longer distant or inviolable, has emerged, almost overnight, as a powerful symbol of the age of man. I wonder how many Republican true believers will cancel their Economist subscriptions over this failure to genuflect to wingnut orthodoxy? The Economist has consistently (over at least the 20 years I’ve read it) had the best science reporting I’ve seen in the popular press. They cover everything, from climate change to genetics to the minutiae of elementary particle physics, with accuracy and clarity. For subjects I know (e.g., CP violation in the B mesons, http://www.economist.com/node/28873) they are spot on, so I have great confidence in the rest. http://www.economist.com/node/21556804 is well done. I haven’t seen any trend charts for the ice edge ecosystem size and timing, which is what is important for this issue. The question of weather loss of Arctic sea ice is a loss or an opportunity is of course entirely subjective. Under the laws of Nature, catastrophe and survival depend entirely on your point of view. A lion killing a gazelle surely perceives his pray as beneficial, although the gazelle would be nuts not to perceives the same event as ‘catastrophic’. Similarly, loss of Arctic sea ice will un doubtfully be a loss for the currently present Arctic eco-systems, in some cases a catastrophic loss. It may also be a benefit for other species, specifically for the part of homo sapiens that is most interested in wealth accumulation and cost reduction to existing industrial endeavors. Rather than deciding on climate action on a ideological basis (which we know by now only incur counter-ideological statements), it may be time to use a true free-market system to balance environmental damage and benefits. That means to put a price on the things we will loose, and a price on the things we may gain, and then let the polluter pay. And yes, that means putting a price on the loss of a species. And a price on the suffering of animals, and a price on the loss/change of entire eco-systems. And yes, that means putting a price on the risk (insurance premium) that by increasing this planet’s mean temperature, we could seriously disrupt (and maybe are already) climate systems, to the point where it could endanger our food supply due to prolonged periods of drought or prolonged periods of heat waves, or prolonged periods of flooding, etc etc. I think there may be a role here for insurance companies to assess long-term risks of extreme weather events, so that we can see anthropogenic climate change in the context of a cost/benefit analysis. Putting a price tag on species is going to be very difficult. Since most of these are essentially “unused” you are going to be arguing for an “intrinsic” price on their worth. There is no chance at all of anyone agreeing what that worth is (I doubt we could even agree on a method, let alone an answer). I agree that it is difficult to even agree on a method, let alone calculating the result. Maybe whatever method we would come up with would also be inherently unethical. What is the price of loosing a single polar bear ? Or the species ? And how would that compare to the cost of loosing say a human ? So, if not by putting a cost on environmental damage, including animals and species and eco-systems, by which method would we ever be able to determine rationally how we could maximize our living standard for homo sapiens while minimizing ecological damage ? [I don’t know how you can value a polar bear, or the species. Obviously, different people would value them differently. I imagine (or, I would hope) that std Stern-time analyses of costs include these, in some fashion. Possibly in a semi-arbitrary fashion. The issue, perhaps, is how much does it matter? Try an extreme example: suppose you do the analysis, and it comes out that polar bear (and other Arctic species whose names I don’t even know) loss comes to 80% of the total costs of GW (implausible, I know, but allow me for the moment). Now suppose that (again implausible) we’re running some global For Great Justice scheme where the industrialised nations tax themselves and redistribute money according to costs; and that this accounting says we owe the Third World $X trillion. Then I think you can see immeadiately that this is going to lead to huge controversy, and endless quibbling about whether it is 80, or 79%, and do we really value polar bears, or whatever. No individual rivet in an airplane, no individual gear in a clock, no transistor in a semiconductor device, no species in an ecosystem. That’s economic logic. Need despoilation be inevitable? And once regions that were beyond wrecking become available do we meekly accept that it’s human nature to continue destroying until there’s nothing left to exploit? Naive and stupid questions, obviously, but nevertheless trading the Arctic in order to create what – another hundred billionaires and add raw material fuel to a consumption driven society hiding behind the walls of its compounds and security forces, ever fearful of someone taking away the tat they’ve collected. The Economist may be regarded as sophisticated reading, but in the bigger picture its delusions are childishly banal, and hawking a severely contained and extremely limited view of possible or even likely futures..
Now some, not Eli to be sure, would tell you that economics is the most important way to value actions, and yet, and yet, a subscriber to the Economist, would tell us that some things cannot be valued. What to do, what to do? [Economics isn’t a way to value things; economics is a way of balancing the values you have. Back when Eli subscribed, the Economist had this habit of saying if then else, except the if was fantasy and the else impossible so the then was not very meaningful. William, regarding the value of the polar bear (or any environmental damage for that matter), I think the price to be paid would have to be installed BEFORE the polar bear would go extinct. Sort of like an insurance policy, so we can still do something about it. Otherwise, postmortem, indeed you will get into endless arguments about how what the right price would be and who would be the beneficiary and why. [I’m all for not making polar bears extinct, as you know. What is tricky is persuading other people of this. Or rather, because I think pretty well everyone given the choice “make that car journey and polar bears go extinct” would choose not to make the journey, the trick is to try to present matters in such a way that the choice becomes clear, or at least intelligible. But the issue I would like to raise is the way in which we make long term decisions : Do we use ideology or rationality ? And if we use rationality, what would be the method by which we assess the risk of damage to environment and our own well-being ? For example, the IPCC assessment of climate sensitivity is 1.5 – 4.5 C per doubling of CO2, with little change of it being less than 1 C, but still a persistently long tail. By our best assessments, the probability of planet Earth at this point having a climate sensitivity of 6 C per doubling is something like 5 %. Now, we are spending trillions (dollars, pounds, euros) in health insurance costs which may or may not prolong our life at some point. By paying this insurance, we hope that the utmost care will be taken for us to reduce our suffering in case of severe health events, and to prolong our life as long as technologically possible. So when faced with a 5 % probability that future generations may endure significant suffering and premature death, why is there no rational determination of the insurance premium to assure that everything technologically possible is being done to reduce that suffering and prolong that life ? Are we deciding by ideology or by reason ? [The health analogy is interesting. The short answer, I suppose, is that people in immeadiate danger of dying will spend all their money to prevent death, even if the benefits are not guaranteed. Doctors have got fat off that for centuries. When considered as insurance, well, most people know people who died, so the idea that they themselves will need this help at some point is not hard to understand. Of course, that doesn’t make the bloated US system rational; or the over-bureaucratic and uncompetitive UK system either. So some of you people actually believe that the polar bear might become extinct? Amazing what propaganda repeated enough will do. Natural resource economists use a lot of different methods to estimate environmental value. They survey people to ask them how much they’d pay to preserve a bird colony or how much they’d pay to have a new bird colony established. They look at tourism data to see if people spend more money at places with greater biodiversity. My understanding is that these methods have widely varying results, but they all agree that the value isn’t zero. Gretchen Daily does a lot of work in this area. Re dismissing rationality, that’s correct. What I probably haven’t done a good job is acknowledging that we should start with rational, platonic ideal solutions. Only then we need to try to figure out what the political and psychological meatgrinder will do with those solutions by the time they hit the ground, and alter if needed. I need somebody to talk strait and with common sense. This is about snow albedo effect, and should fit right in with the “melting north” title of your post. 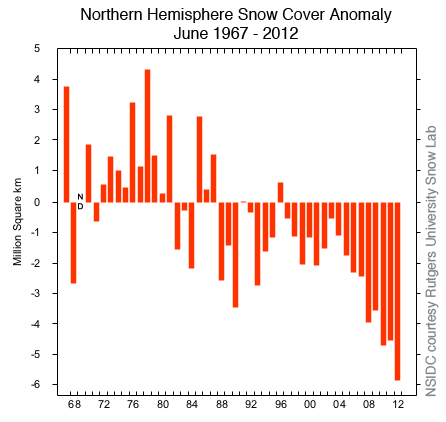 The NSIDC just presented the snow anomaly for June 2012. A whopping 6 million km^2 anomaly. This is a record in this data set (since the 60’s), by a large margin. June 2012 shows virtually no snow in the Northern Hemisphere, except for Greenland. Now, most of the snow anomaly is around the Arctic (obviously), and we know that insolation on the ground in June around the Arctic is something like 280 W/m^2. Over 6 million km^2, assuming a drop in albedo from 0.8 with snow to 0.1 without, this means that an astonishing 1180 TW power anomaly is currently absorbed by the Arctic perimeter. Considering that all of human’s energy use (fossil fuels and the rest) is something like 17 TW, and 70 TW keeps the Barents sea free of ice in WINTER and 1180 TW is enough heat to melt out 3.6 million ton of ice PER SECOND, or close to 1/3rd of the Arctic winter sea ice volume. Spread out over the entire Northern Hemisphere this extra power influx in June amounts to 4.6 W/m^2. This is significantly more than the total GHG forcing currently active, which makes the snow albedo effect a perfect example of Arctic amplification. and based on GCM simulations, you (and Tietsche et al) have presented research that suggests that Arctic sea ice would recover if all ice would be taken away. Now, my question is this : Do/did GCMs simulate snow cover in a realistic way ? Do GCM simulations project anomalies like the 6 million km^2 observed in June 2012, and if they do, do that also generate that 1180 TW power anomaly ? 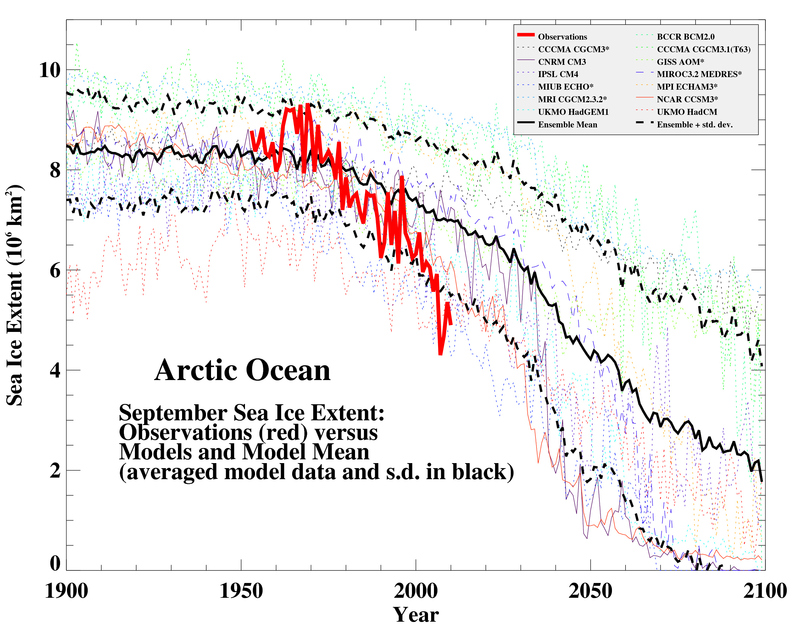 And if they do that, then why do they not project much more sea ice melt during summer than the graph presented above suggests ? [I can only speak for HacCM3 in any detail, and of course I no longer have access to the data (other than the publically available stuff, and I don’t have access to anything to work with it). So: snow cover is simulated moderately realistically: as you’d expect, there is a “snow depth” variable, snow mass is accounted for, and energetically balanced. And snow albedo varies with depth (and temperature?) (but not, in HadCM3, with age I think. Nor would it take into account dirtying but soot). And I’ve forgotten the rest: in Antarctica, the snow model wasn’t very relevant or interesting :-). You mean “underestimate the decline” I think. Unfortunately, I don’t know. Thanks William, for sharing this info with us. That’s understandable. I find a lot of publicly available results from GCMs in scientific papers. but the presented data is (of course) pre-selected by the reseachers that are typically focussing on one aspect out of the GCM simulations. Especially the very significant drop in snow cover since 2000 is quite remarkable, and it would be utmost interesting to see how snow cover developments are projected with the GCM simulations. Equally important (especially for developments of thick multi-year ice) would be to have access to ocean-current heat fluxes as simulated by the GCM projections. Either way, if it is true that “that idea is beginning to look broken” as you say, then should we not be able to find out WHY ? It seems to me that investigating ALL variables in GCM simulations and testing them against observations should at least reveal which variable(s) seems to be the most off. That should give some clue as to where to which modules of GCMs may require a thorough review, so that future versions would significantly more accurately project crucial observable variables such as sea ice extent. In that regard, do you know if there is something like GCM equivalent of NOAA’s NCEP/NCAR site ? Where one can enter variables and a time frame and obtain instant plots of mean value or anomaly info ?